UPDATE: Boo is actually an adult book. I wasn’t aware of this when writing the following review. With that in mind, I think this book is perfectly fine for it’s audience but that it might confuse people with the childish cover and young protagonist. 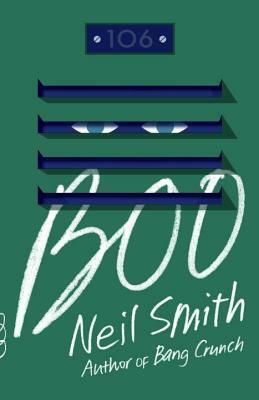 Teen books have been known to take on some heavy topics in recent years, but I think that Boo may take the prize for covering as many of those hard to discuss topics as possible. It still has the possibility that it will be listed as adult fiction, but I think it could be read by a fairly wide demographic. Synopsis: Oliver (aka Boo) is as pale as a ghost, finds solace in the periodic table, and has a defect in his heart. When he finally manages to recite the entire periodic table while standing at his locker, his moment if triumph is suddenly cut short by total blackness. He wakes up in a strange room, totally naked, and learns that he has just become the latest resident of Town, the place where all American 13 year olds go when they die. Sure that his heart has finally failed him, Boo takes his death in stride until another boy from his school shows up a week later. Smith has done a wonderful job of building the suspense in this book. Boo is your typical “nerdy kid who doesn’t fit in” character, but he’s just socially competent enough in Town to make a few new friends. My biggest hangup with this book is when Boo decides that he doesn’t want to use the name “God” when talking about whatever almighty being has placed them in this purgatory of sorts. Instead he decides to call him Zig, which makes little sense to me because everyone is still talking about the same deity. It adds nothing to the story, and actually gets to be a bit annoying. I do love that the afterlife is not the clichéd version of heaven or hell that we have all come to expect. Town is just that, a town. The residents live in dorms, stuff magically shows up when it is needed, but the food still needs to be cooked and doing something stupid still means a broken bone. For a town run by 13 year olds, it’s remarkable how smoothly things work, but as many of them have been in town for longer than they were alive, it only makes sense that they would have matured somewhat over the years. Although I enjoyed this book, I don’t know how well it will do in the teenage market. Like I said in the beginning of my review, this book touches on a lot of heavy subjects. It is going to be a hard sell because no one wants to overwhelm a young reader with content that is too mature. Thanks for sharing your thoughts. I too have read Boo (review to come!). Although the narrator is 13 years old, it isn’t a ‘teen’ or ‘YA’ book. It is written for an adult audience and has been marketed that way. When reading the cover copy, it’s easy to mistake the book for YA. When reading it, I often felt like it could be a YA book… so, I get were you are coming from. I’m sure you are not the only one who thought it was meant for a teen audience. It’s a hard book to peg! Cheers.